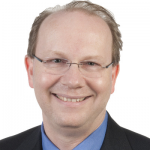 Stephan Biller is the Vice President for Offering Management at IBM Watson IoT. He is responsible for all Operations product strategy and offerings helping clients to drive operational excellence from factories and supply chains to the operations of oil fields and power plants. His major product lines include IBM Maximo, TriRiga, and Industrie 4.0 Analytics. He is a recognized thought leader in Industrie 4.0, Digital Twin, and AI for Manufacturing. Prior to joining IBM in 2017, he served as the Chief Manufacturing Scientist & Manufacturing Technology Leader for General Electric creating GE’s Brilliant Factory initiative as well as its Additive Manufacturing software strategy. Earlier positions include General Motors Fellow & Global Group Manager for Manufacturing Systems. Stephan holds a Ph.D. in Industrial Engineering and Management Sciences from Northwestern University, along with an M.B.A. in Finance and Strategy from the University of Michigan.